On October 11, 2017, the Low Carbon Vehicle Partnership (LowCVP) announced the 2017 Low Carbon Champions Awards. BYD UK – the London branch of BYD Auto – won the "Low Carbon Heavy Duty Vehicle of the Year Award" and jointly won the "Grand Prix" – the top award – with Transport for London (TfL) and Go-Ahead London for their partnership in launching London’s first two all-electric bus routes (507 and 521). This award specifically noted BYDs contribution in delivering the vehicles, operational capacity, and infrastructure for the London project. Founded in 1995, BYD engages in IT-related and automobile business for traditional fuel-powered vehicles and new energy vehicles. With 30 production centers established around the globe, BYD is the only vendor that owns both power battery and vehicle technologies in the new energy field. BYD is experiencing a period of rapid business development and a proliferation of operational processes. This is generating a large number of concurrent data flows from product sales, spare parts inventory, and after-sales services. The data volume of most manufacturing enterprises' online transaction management systems doubles every two years, and concurrent requests to the Enterprise Resource Planning (ERP) system grow exponentially, leading to high I/O frequencies and long user wait times. This increase in data to be analyzed by the BI system, combined with the shorter timeframe in which data must be processed and reports generated, imposes stringent requirements on data loading and processing speed, as well as system stability. The BI system is a must-have tool for enterprises' manufacturing planning, sales analysis, market trend forecasts, and other important business decision-making. SAP's ERP system lies at the heart of many manufacturing enterprises, and BYD is no different, relying on this system to support its three product lines. At BYD though, rapid service development, a 100 percent staffing increase, and a 10 percent quarterly order increase put a strain on the system. The ERP system simply couldn't handle the required 185,000 Input/output Operations Per Second (IOPS) and 60,000+ concurrent services during peak hours. It was so inefficient, it once took over an hour to query the monthly SAP ERP financial statements. Access performance was so poor, the ERP system could not be used for service development. In one extreme case, a system breakdown even jeopardized production line operations. As a leading global Information and Communications (ICT) solutions provider, Huawei offers end-to-end solutions covering networks, cloud computing, servers, databases, and storage. Trusting this reputation of technological expertise, BYD brought in Huawei to analyze the ERP system's server memory, Central Processing Unit (CPU) utilization, network, and disk response rate. It was from this analysis that Huawei determined that the bottleneck was occurring at the system's storage devices. The ERP production system generated more than 200 GB of data per month, and the live network required a latency as long as 50 ms to input and output read/write data. This meant the system could only handle a few thousand IOPS, far below the 185,000 IOPS required. The need for a system upgrade was clear. The traditional Hard Disk Drive (HDD)-based storage BYD was using simply could not meet the required level of read/write performance. On top of their current problems, BYD forecast even further service growth in the coming years, so they needed to at least double the ERP system’s performance, and do so without changing the system architecture. BYD's IT O&M department also needed to be able to smoothly perform the upgrade with minimal impact on services and production operations. 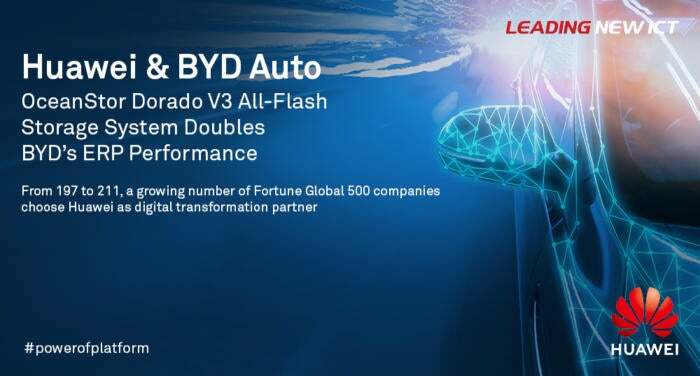 Based on these requirements and the analysis results of BYD's live network, Huawei created an OceanStor Dorado all-flash acceleration solution for BYD. In this solution, HDD-based storage was replaced by all-flash storage to expedite read and write I/O and make the ERP and Business Warehouse (BW) systems more efficient. No changes were made to the live network architecture, databases, hosts, ERP software, or O&M, so as to avoid possible risks. To keep the system upgrade from affecting services, the Huawei data migration team provided a set of data mirroring workarounds using host volume management software. 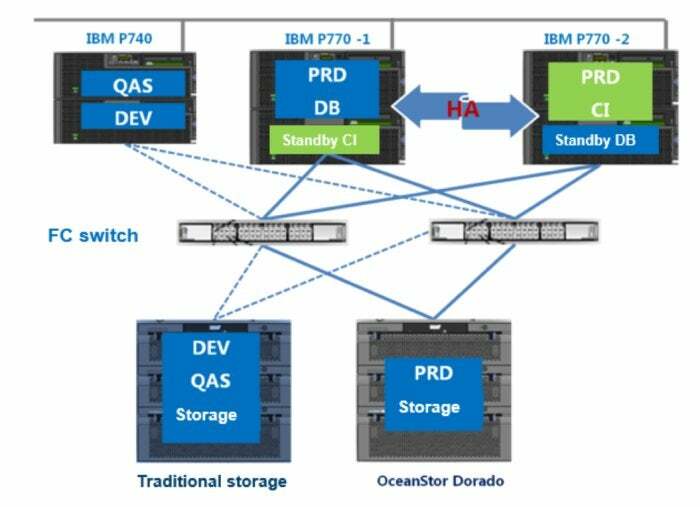 Legacy data was also migrated to the OceanStor Dorado All-Flash Storage without affecting ERP services. Upon Huawei's recommendation, BYD retained their development and test systems and Sandbox on the legacy storage system to protect their investment. Since the deployment of Huawei OceanStor Dorado All-Flash Storage on BYD's ERP, system efficiency has increased 500 percent, and system latency has been cut down to less than 1 ms. With the ERP's query condition design and upper-layer platform, BW system data extraction time is down 66 percent, and Materials Management (MM), Production Planning (PP), Sales and Distribution (SD), and Finance and Cost controlling (FICO) module reporting is more than two times faster than before. Material voucher queries can now be completed in four minutes, instead of the previous 14 minutes. To provide BYD's required capacity and performance, a traditional HDD-based storage system would have needed to be configured with RAID 10 technology and Serial Attached Small Computer System Interface (SAS) and Solid-State Drive (SSD) disks, and would have taken up 40U of cabinet space. Huawei OceanStor Dorado All-Flash Storage, on the other hand, uses RAID 6 and an SSD-only configuration, requiring only 20U cabinet space. It involves 50 percent less installation space and O&M labor cost and significantly saves electricity and cooling cost. Over the next three years, Operating Expense (OPEX) will be reduced by an estimated 70 percent, which will have never been possible with traditional storage. After Huawei OceanStor Dorado had run the ERP system continuously for more than six months on BYD's live network, there had already been noticeable improvements in service performance and reductions in maintenance costs. BYD was more than satisfied with this IT system reconstruction. Wang Hongbo, BYD's information center manager, said, "After replacing our traditional HDD-based storage with Huawei's OceanStor Dorado All-Flash Storage, our ERP BW system applications run faster and performance has more than doubled. In the first month alone, we experienced no disruption in data Extract-Transform-Load (ETL) while we saw at least one disruption every two days with our old system. Data extraction time has shortened from 4.5 hours to 1.5 hours, greatly increasing our report generation and helping our executives make more timely decisions." The ERP system reconstruction project was so successful, BYD chose Huawei's Dorado All-Flash Storage again for its next Document Management System (DMS) and Extended Warehouse Management (EWM) system upgrade. Dorado's superb performance and robust stability again impressed BYD. BYD and Huawei also plan to further cooperate in smart manufacturing for "Made in China 2025".